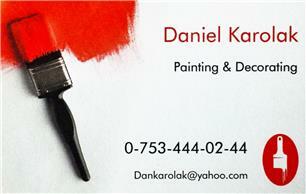 DK Painting & Decorating - Painter/Decorator based in Sutton, Surrey. If you are looking for a professional painter with over 10 years’ experience and competitive rates, call me on 0753 444 02 44 and get your free quote now. I'm able to undertake single rooms or complete redecoration of your home, with no job too small to consider. I will always leave your property clean and tidy after work. I provide a Dust Free sanding service. I cover Central and South London and most of Surrey. Lining and preparation for hanging of all papers type. Fitting coving, picture rails, dado rails and skirting boards. Repair of blown bubbling and flaking masonry paint.